The 580 is a fully optimized interchangeable dual lens system. Unique to this design is a visual experience not found in any dual lens frame styles. The nose architecture is built to sit on the face reducing the eyes perceptive awareness of the nose. So when the athlete is looking across the bridge there is basically no interference. The frame is like a feather weighing just one ounce. 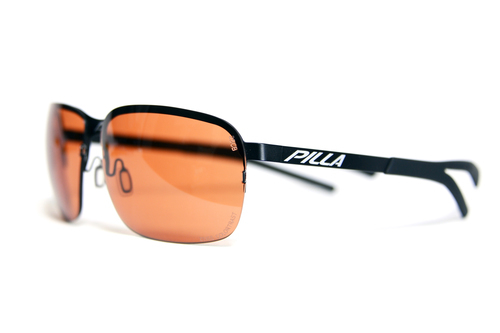 The 580 integrates the same Pilla signature "fork" temple tip design found in our professional frame systems. The tips are made of a high performance rubber called "Megol." The 580 integrates a new lens anchoring system using "Shadow Boxing" on the lens edges. This open box design anchors the lenses and provided an extremely simple method of un-hooking the lens from the frame. This proprietary design is fully adjustable. The temple tips have high performance rubber over the top of a bendable inner cord. Both teeth of the fork can be independently adjusted to contour the head. The lens is edged to create a slot that is placed into the frame at the nose and then the temple. The entire frame assembly acts like a big spring to hold the lens. The 580 lenses change extremely easy with minimal pressure. This new system allows for quick changing of the 580 lenses to maximize the full compliment of the 8 new Colortrast filtrations. See below for other items in the 580 Steel family to purchase.